I am a big fan of Ken Henderson’s books, I believe that every SQL Server developer should have a copy of his books. 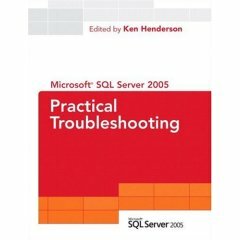 When I noticed on Amazon.com that the book SQL Server 2005 Practical Troubleshooting: The Database Engine which listed Ken Henderson as its editor would be coming out soon I got very excited. I decided to send Ken an email to see if he would be willing to answer some questions I had about the book. To my surprise Ken was more than willing to accommodate my request. The question-and-answer session with Ken that follows was conducted via email. Denis: What is the audience for this book, is it the enterprise user or can a small department benefit from the tips in this book? Ken: Both types of users would benefit. Anyone who’s ever had a problem with SQL Server has probably noticed how few resources there are out there for troubleshooting SQL Server issues. There are plenty of resources that talk about how it works. There are many that discuss how to write code for it. But there are scant few that talk about what to do when something goes wrong. This book is intended for that audience. It is also intended for those who want to better understand how the product works and to be prepared in the event that something does go wrong with it. SQL Server doesn’t break often, but, when it does, this book will help you deal with it. Denis: For a customer who has a performance problem that is not hardware related, what would you say are the most important chapters in this book (in order of importance)? Ken: The Query Processor Issues chapter and the Procedure Cache Issues chapter are the two best for this type of problem. Denis: Seven developers from the SQL Server development team and three support professionals from Microsoft Customer Support Services wrote this book. What took so long to write a book like this, and why wasn’t there a SQL Server 2000 version? Is it because SQL Server has truly grown to be a major player in the enterprise market and there is a definitive need for a book like this now? Ken: The book took so long because all of the authors are first-time authors, and they are very busy people. There was no SQL Server 2000 version because I was too busy with my own projects to begin this project back then. SQL Server is indeed a major player in the enterprise, but I believe it has been since SQL Server 7.0. That particular aspect had nothing to do with the timing of this book. Denis: I noticed you are listed as editor of this book. Have you written any chapters in this book? Ken: No, I did not write any of the chapters of the book. I also tried to preserve each author’s writing style. Each chapter includes its own byline, and I have edited them as little as possible. Because some of the authors were more capable than others, I necessarily had to be involved to varying degrees with each chapter. Some chapters needed lots of editing; some very little. I think each individual perspective represented in the book is a valuable one, but I also think they speak in unison on the important points of practical troubleshooting with SQL Server. Denis: What new technologies in SQL Server 2005 do you think are the most beneficial for performance? Ken: There are really too many to list. A few that come to mind at the moment: instant file growth, improved wildcard support, more sophisticated cache management, improved scaling on big hardware, the XML data type and richer XML support in general, CLR integration, etc. Denis: This book as I understand has a lot of internals information from the people who either wrote the product or have supported it that currently is not available anywhere else--is that right? Ken: Yes, the majority of the authors were actually developers on the product. A few were support engineers who supported the product. All have had full access to the SQL Server source code for many years. Denis: What will a person who reads this book gain in terms of understanding how to performance tune a server? Ken: They will better understand both how the server works and also how to recognize and troubleshoot common performance problems. Denis: Is the book geared towards a beginner/intermediate level user or do you have to be an advanced user to really utilize the information in this book? Ken: There is something in this book for everyone. I’d like to think that beginners, intermediates, and advanced users alike would benefit from reading it. Denis: What are the most important things a person can do to master SQL Server? Denis: What are the most important things a person can do to master Transact-SQL? Denis: What SQL Server books are on your bookshelf? Ken: I have Celko’s books, Darren Green’s book, and a few others. Unfortunately, I don’t have time to read as much as I’d like. I spend most of my time either writing code for the product or studying code written by others on the SQL Server development team. The majority of my research into how SQL Server works happens via studying its source code directly. Denis: Why do you write technical books? Ken: I write technical books because I enjoy passing on what I’ve learned as a developer. That’s different from enjoying teaching people. I do enjoy teaching people, but that’s not why I write books. Some of the things I’ve learned about SQL Server took me years to master. I enjoy passing that on to people so that they don’t have to travel the same arduous roads that I did. I enjoy helping people. That’s different from teaching for the sake of teaching. I could never train people for a living. I am a programmer by trade, and everything else is an offshoot of that. If I didn’t think I had something unique to bring to the discussion, I don’t think I’d write books. I don’t ever want to do what has already been done. I want to bring a fresh perspective to technical books, and I want to explore things in ways most other authors wouldn’t. If my work was exactly like everyone else’s, there’d be no reason for it to exist, and I wouldn’t bother. Given that I’ve never written fulltime but have always held down a regular day job while writing my books, the work itself is simply too hard to do just to be a clone of someone else. When people pick up one of my books, I hope they know right away that it’s one of mine, that it speaks with a distinctive voice, and I hope they think they might learn something from it simply because they trust me as an author. Denis: Why did you join Microsoft? Ken: I joined Microsoft to get inside SQL Server. I felt that the only way to go beyond the books and whitepapers currently out there on SQL Server was to see the source code for myself, and the only way that was going to happen is if I joined the company. I wanted to approach the exploration of SQL Server from a career developer’s standpoint, something that I had not seen done before. Most SQL Server books were written by professional trainers and former DBAs. As a career developer, I thought I could bring a fresh perspective to the coverage of SQL Server, and I felt the only way to really do that was to “go live with the natives” for a few years. Denis: Who are your favorite authors? Ken: Mark Twain, Kurt Vonnegut, Bart D. Erhman, Robert Price, Dean Koontz, Stephen King, Joe Celko, Sam Harris, Richard Carrier, Don Box, David Solomon, Charles Petzold, Kent Beck, Martin Fowler, Bruce Eckel, and many others. Denis: Who do you consider your rival authors? Ken: I don’t really think of anyone else out there as a rival. When I write a book, I mainly measure my work against my concept of the perfect book. I write for me. There’s a great book out there titled On Writing Well where the author, William Zinsser, repeats the old truism that quality is its own reward. It really is. I love the fact that people enjoy my books, but, really, the day I finish the final draft of a book and can say that I’m really done with it (at least for the moment :-) ), I’ve accomplished my goal. If it never sold a copy, I’d still feel fulfilled. I do care how it sells against other books, but I don’t really focus on it and don’t get caught up in any type of rivalries with other authors or other books. Because I always want to write a better book than I wrote last time, I necessarily compete with my previous work and I compete against what I think the ideal technical book is. I think there’s enough room out there for lots of technical authors (it’s not as though people only buy one technical book and no others), and I have special empathy for my comrades out there who have to slog along in the middle of the night to crank their books out. Denis: Where did the “Guru’s Guide” concept come from? Ken: Wayne Snyder, one of the MVPs reviewing the manuscript for the first Guru’s Guide (which was at that time unnamed), wrote in the margin, “Hey, Ken, this is really a guru’s guide to solutions to hard T-SQL problems!” at which point the marketing folk at Addison-Wesley saw this and seized upon it. We had kicked around several titles, but hadn’t settled on any of them. As soon as they saw this, they pushed me hard to use it, and I reluctantly agreed. I didn’t like it initially because I thought the title of a technical book should focus on either the subject material or its intended audience, not its author. There was an understanding that we’d revisit the title when we did the second book (I was originally under contract to do three SQL Server books for Addison-Wesley), but then sales of the first book exploded, and there was no way we could change it at that point. Denis: What do you think of all the accolades the Guru’s Guide books have received? Ken: I am appreciative of them, but continue to be surprised by the longevity of the books and the reception they’ve garnered. I thought I was writing a niche book when I wrote that first Guru’s Guide book. I just wanted to get down everything I knew about T-SQL before I forgot it ;-). I will continue to write the kinds of books I like to read as long as people will buy them, so I hope that people continue to enjoy my work. Denis: Will you be updating your Guru’s Guide books for SQL Server 2005? If so, when will they be out? Ken: Yes. The second editions of the Guru’s Guide books should be out in 2007. Denis: Describe your most unpleasant experience as an author. Ken: I had a particularly unpleasant experience during the work on my architecture book when I had to send one of the technical reviewers packing. He was someone who’d provided useful feedback on my work in the past and someone I’d handpicked to review the book for technical issues. I usually appreciate negative feedback during the technical review process and generally consider it the most useful type of feedback, but this reviewer focused more on arguing with me about what should and shouldn’t be in the book than reviewing what was there for technical accuracy. He had a problem with the fact that I spent the first 300 pages of the book (the book ended up being over 1000 pages long) covering fundamental concepts (e.g., Windows internals) that I thought people needed to understand in order to understand the rest of the book. I had seen people within Microsoft struggle to understand SQL Server internals because they did not have a good grasp of how Windows worked or how XML worked or how COM worked, or whatever, and, assuming readers would likely face the same types of challenges, I set out to remedy that in my book. I also wanted to go deeper than any SQL Server book ever had, and that necessitated being able to assume a certain amount of fundamental knowledge going in. I wrote him back after his first objection to the section and told him that, while I respected his opinion, I had my reasons for including it, and I explained those reasons as best I could. He suggested I just refer people to authors like Richter and Solomon and those guys, and I told him I’d considered that, but that ultimately I felt that would be cutting corners and would be a huge inconvenience since readers would have to purchase several other books just to understand mine. No single other book had all the technical fundamentals I felt were essential, nor did any of them cover the material the way that I wanted it covered--in a manner that was designed especially for DBAs and database people. At the same time, most readers wouldn’t be able to skip the fundamentals coverage in some form or fashion because they wouldn’t be able to understand my SQL Server internals coverage without it. While it was certainly a huge amount of work for me to include this section (it was much like writing a whole separate book), I felt it was the right thing to do. He persisted with his objections and continued to voice them not only to me but also to the editing team at Addison-Wesley. I told him on several occasions that I respected his opinion, but that, as the author, the call was mine to make and that I’d made it. This seemed to irritate him, and he continued to consume a certain amount of my time with correspondence related to the subject. At one point, I counted 7 separate threads from him on that one subject in my Inbox, and the folks at Addison-Wesley had begun to complain about him. The fundamentals section, and his negative remarks regarding it, came to dominate all the feedback we got from him. While other reviewers were either indifferent to the coverage of Windows internals in a SQL Server book (it was certainly a novel approach) or embraced it outright, he became increasingly more negative as we went along. We got useful feedback on the entirety of the manuscript from all the other reviewers, but he seemed unable to move on from the fundamentals issue. Eventually, I had my fill of dealing with him and cut him loose from the project. I’m a fairly patient person, but I just didn’t have time to deal with him anymore. Technical reviewers sometimes get on crusades and attempt to usurp the role of the author to some extent. Until this happened, I’d never personally experienced it, but I’d heard of it. At the end of the day, the decision as to what is and isn’t in a book is the author’s to make, and the role of the technical reviewer is to identify technical issues with whatever it is that will be in the book. Decisions about content belong to the author, and, to a lesser extent, the publisher and the publisher’s editing team. I guess the lesson I learned here was to be more careful with whom I select for involvement with my projects. I always want honest feedback, and, fortunately, I know a lot of people who will happily point out every technical issue they find with my work without trying to become a de facto coauthor. Would you recommend reading Ken's "SQL Server 2005 Practical Troubleshooting: The Database Engine" book? Is it still valid for SQL Server 2008-2012? Do you know if second editions of Ken's books are availabale? What Are You Watching On Halloween? Do You Know How Between Works With Dates? Non Technical: What Sleepless Nights?